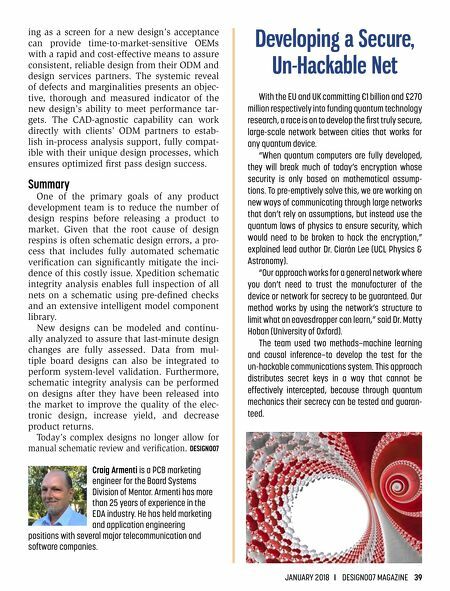 JANUARY 2018 I DESIGN007 MAGAZINE 39 ing as a screen for a new design's acceptance can provide time-to-market-sensitive OEMs with a rapid and cost-effective means to assure consistent, reliable design from their ODM and design services partners. The systemic reveal of defects and marginalities presents an objec- tive, thorough and measured indicator of the new design's ability to meet performance tar- gets. The CAD-agnostic capability can work directly with clients' ODM partners to estab- lish in-process analysis support, fully compat- ible with their unique design processes, which ensures optimized first pass design success. Summary One of the primary goals of any product development team is to reduce the number of design respins before releasing a product to market. Given that the root cause of design respins is often schematic design errors, a pro- cess that includes fully automated schematic verification can significantly mitigate the inci- dence of this costly issue. 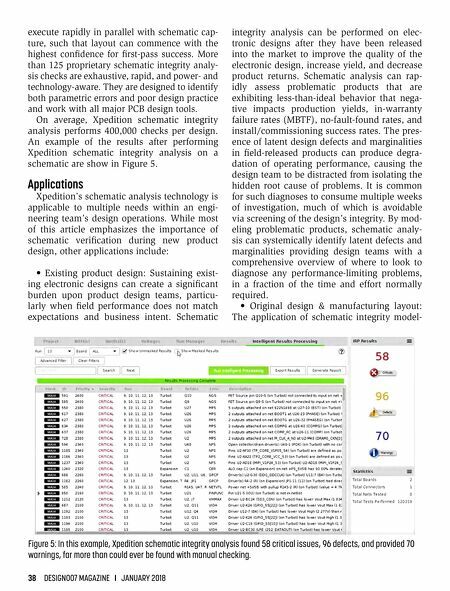 Xpedition schematic integrity analysis enables full inspection of all nets on a schematic using pre-defined checks and an extensive intelligent model component library. New designs can be modeled and continu- ally analyzed to assure that last-minute design changes are fully assessed. Data from mul- tiple board designs can also be integrated to perform system-level validation. Furthermore, schematic integrity analysis can be performed on designs after they have been released into the market to improve the quality of the elec- tronic design, increase yield, and decrease product returns. Today's complex designs no longer allow for manual schematic review and verification. DESIGN007 Craig Armenti is a PCB marketing engineer for the Board Systems Division of Mentor. Armenti has more than 25 years of experience in the EDA industry. He has held marketing and application engineering positions with several major telecommunication and software companies. Developing a Secure, Un-Hackable Net With the EU and UK committing €1 billion and £270 million respectively into funding quantum technology research, a race is on to develop the first truly secure, large-scale network between cities that works for any quantum device. "When quantum computers are fully developed, they will break much of today's encryption whose security is only based on mathematical assump- tions. To pre-emptively solve this, we are working on new ways of communicating through large networks that don't rely on assumptions, but instead use the quantum laws of physics to ensure security, which would need to be broken to hack the encryption," explained lead author Dr. Ciarán Lee (UCL Physics & Astronomy). "Our approach works for a general network where you don't need to trust the manufacturer of the device or network for secrecy to be guaranteed. Our method works by using the network's structure to limit what an eavesdropper can learn," said Dr. Matty Hoban (University of Oxford). The team used two methods—machine learning and causal inference—to develop the test for the un-hackable communications system. This approach distributes secret keys in a way that cannot be effectively intercepted, because through quantum mechanics their secrecy can be tested and guaran- teed.